We have decided to do the project on March 20th (Sunday). There are totally 20 students participating in the project, we have divided them into 4 groups. To know about the technical aspects of the project children spent an hour after the school hours from March 15 onwards. 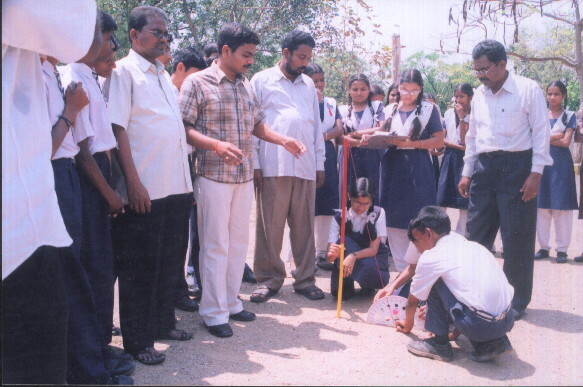 By 11â€™o clock on the day of equinox, all the teams were ready with their measuring sticks in the ground. They measured the length of the shadow from 11:45 to 12:30 for every 10 minutes. They recorded shortest shadow at 12:20 PM (i.e, the local noon at Warangal). Then we sat down for calculating circumference. Using trigonometry they fond the angle of the sun, which equaled the angle at the center of the earth. The distance between warangal and equator was found to be 1998 KM, so 1998 * 20 (20 sectors) gave us the circumference. We invited the Director of the planetarium and press to our school. The Director was with us till we calculated the circumference. He felt happy and thanked us for making him learn about Eratosthenes. All the local news papers and TV channels covered this news. We had lots of fun. Information about the school: Grade level : 8, 9 The name of our school is shanti niketan high school.located at warangal in state of andhrapradesh in india. Warangal is a historical city,the capital of kakatiyas. In 11th century ad. (visited by marco polo ). We have great masterpiece of architecture like thousand pillars temple, fort, ramappa temple etc. Our school is one of the reputed schools in warangal with a strength of 1200. Apart from studies we learn classical dance (kuchipudu), music (carnatic vocal), karate etc. We have done a science fair recently in our school, it is exciting to do this live project now. There are nearly 50 students participating in this project. They have been divided into 10 teams,they have already gone for a mock measurement, and they are busy writing the project report.